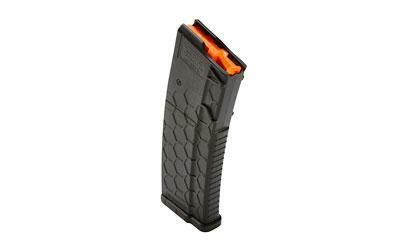 Hexmag Series 2 5.56/.223 magazines have a revised feed lip design for greater rifle compatibility. This allows for easier seating on a closed bolt and greater retaining due to the revised mag catch pocket and lead-in ramp. New grooves allow for fast and easy loading with stripper clips. Made with the latest technology in materials and manufacturing processes has created a new and more durable AR-15 magazine. Compatible with 5.56, .223 Remington, and 300AAC Blackout.